M.I.A. is back, representing the world town with power. Our Maya Arulpragasam's all grown up. The British/Sri Lankan singer, better known as M.I.A., has taken on the making of an album -- from conception to production to execution -- for her sophomore LP, and the results are astounding. If indeed Arular was the best UK debut since Dizzee Rascal's Boy in da Corner, Kala must be the best UK follow-up since, maybe, A Grand Don't Come For Free. In almost complete apposition to the substantive leaking of Arular for months and months before its official release, a strict and admirable silence has been maintained by Interscope around Kala until just a few weeks ago. As a result, anticipation's been running high, for (we now know) great reason. In one way, the album's quite similar to the Knife's masterful album of last year, Silent Shout: the first time you listen, the thing seems quite insubstantial -- three well-recognised tracks, three more built off existing beats or familiar ideas, and a few more heaving electro bangers, and a finale that takes away your breath. Of course, it's not insubstantial at all -- just, in the marriage of innovative production and pop concision we're given gems of songs that, because they slip by too quickly, can provoke an "I wish there was more" reaction on first listen. Listening to Kala the first time, you're plunged into a new sonic world. It's drums that come from time spent in Liberia, soca and dancehall rhythms from recording in Jamaica, Bollywood disco, and even Baltimore club beats. Part of M.I.A. 's new boast is repping the "World Town" -- which mainly stems, it seems, from her time spent in Liberia, and Diplo's work with the Australian Aboriginal kids for his Heaps Decent project. On the whole, there's less of the militaristic rhetoric and, in fact, the artist denies the influence of her father completely these days. As a person and an onstage presence, Arulpragasam doesn't always come across fully polished (it's part of what we love about her): taking on the garish colours of '80s fashion, or reacting volubly (in all caps at least, on her MySpace blog) to those who suggest her songs are primarily producer-created. It's not easy to separate the producer from the song, for rap especially; but we can be satisfied at least that M.I.A. 's credited for co-production on all the songs on Kala. The bulk of the rest of the production credit should go to Switch, though Diplo and Baltimore producer Blaqstarr also worked with M.I.A. on a few tracks. Still, the songs on this album are such dense condensations of disparate elements that the most obvious (and perhaps only) unifying factor is M.I.A. 's own disaffected voice and her constant wide-eyed wonder: let me share this awesome sound I have found with you. This spirit informs "Jimmy", a re-working of an old Bollywood film's theme song; "Hussel"'s guest spot from London-via-Nigeria rapper Afrikan Boy; and "Mango Pickle Down River". This last song will be familiar to Australian listeners from the popular/cute Morganics-produced "Down River", which became a Triple J radio hit in 2004. M.I.A. throws a few childlike verses in, but the song's essentially the same as it was when previously released. We should be wary of artists plundering "world music" sources for material that they present as their own, and M.I.A. walks somewhat close to that line a few times on Kala; but in the end her sources are altered enough that she's justified in fully "owning" her songs. Though there's plenty of hustle on Kala -- from "Bamboo Banger"'s "M.I.A. coming back with power power" to the drug-slinging persona of "Paper Planes", it's her meditation on the unfortunate influence of rap's portrayal of 'the game' on those in the developing world that obviously means the most to her. On "Hussel", she asks "Hustle, hustle, hustle, cry, cry, cry / Why does everyone got to hustle all the time?" Kala, like Arular, may be a party record, but its creator obviously feels the sting of responsibility. That empathy's not totally coherent on the album, but maybe that's a side of M.I.A. that will develop more fully in the future. The biggest hustle, with the biggest payoff, may be "$20". It's not really a continuation from her earlier song "$10" so far as I can tell, though if each of her albums has a money song as deeply enjoyable as this I'm not complaining. Put simply, it's M.I.A. 's version of the Pixies' "Where Is My Mind?" over the bassline from "Blue Monday", slowed down and played on sawing, crunchy synths. It's got to be heard to be believed. "Come Around" is the track M.I.A. recorded with Timbaland for his album of earlier this year. The song was included on the UK version of Shock Value, and should have been here as well -- it's better than anything on Timbaland's album. Worse, it doesn't fit with M.I.A. 's inventive exuberance, and, though it's a great song, sounds somewhat staid at the end of this collection. In the time between the first leak of "Galang" in 2003 and now, indie dance has changed quite a bit. Baile funk rhythms are no longer a delightful novelty. Attitude-laden female rappers and flat, unaffected vocal melodies have become par for the course from Tigarah, CSS, Bonde do Role, New Young Pony Club, and others. But M.I.A. neatly avoids becoming another faceless electro artist or female rapper. 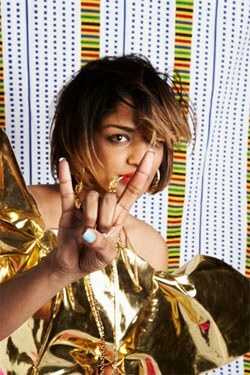 By combing the world for material but staying true to what interests her of its own accord, M.I.A. has managed to create another LP full of innovative, endlessly pleasurable songs. Again, M.I.A. has given us one of the albums of the year. Bravo.